Andrae Ballard is a true American hero whom we wish to recognize for his years of service in the US Army. Serving in the military is a very demanding profession that requires both personal and family sacrifice. Not everyone has the desire to put America’s needs over their personal needs. One such individual that has made the sacrifice is Andrae Ballard. As many of our followers and customers know, we are custom picture framers with a presence both online and locally in Richmond Hill, GA. The scope of our custom picture framing services extends from small birth announcements up to very large and very complex military shadow boxes. As part of the framing process, we try to learn a little bit about the individuals who hire us to do their picture framing. Knowing something about them enables us to do a much better job telling the story behind the items they wish to have framed. One such individual that we recently had the privilege of serving is Andrae Ballard. Andrae was retiring from the U.S. Army when he came to us and engaged our services. He was seeking a military shadow box that reflected his career. As we got to know Andrae, we discovered many of his commendable attributes. We learned that Andrae Ballard is a graduate of the United States Military Academy at West Point. At West Point, he received a commission as an Infantry Officer. With nearly fifteen years of military service, he has served at every echelon from platoon through Corps level operations. Andrae Ballard is also an academician. In addition to his military career, he is also a part-time faculty member at Central Texas College, teaching in the Mathematics Department. His academic achievements include a BS in Systems Engineering from West Point and an MS from Central Michigan University in Human Resources Administration. Andrae’s most recent assignments included serving as the Aide-de-Camp to the 8th Army Commanding General in Yongsan, Korea. 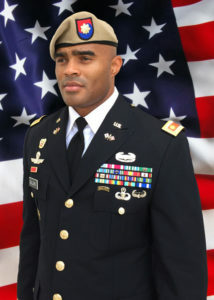 He also served as the Public Affairs Officer for the Special Operations Command Korea Commanding General and the 1st Armored Brigade Combat Team, 3rd Infantry Division at Fort Stewart, Georgia. Andrae has been a Brigade Communications Officer for the 1st Heavy Brigade Combat Team, 2nd Infantry Division in Camp Hovey, Korea, as well as for the 1st Battalion, 75th Ranger Regiment at Hunter Army Airfield, Georgia. His deployments include multiple combat tours in Operation Iraqi Freedom and Operation Enduring Freedom (Afghanistan). Andrae is a graduate of the United States Army Command and General Staff College. In addition, he has graduated from the United States Army Jumpmaster and Ranger Schools. He is the president of Alexander Graham Properties LLC. This is an organization that provides resources and consultation to individuals in need of financial help. Our appreciation for Andrae Ballard goes beyond a simple customer/business relationship. The complexity in the design of a shadow box for Andrae revealed much about him as a person and a great human being. 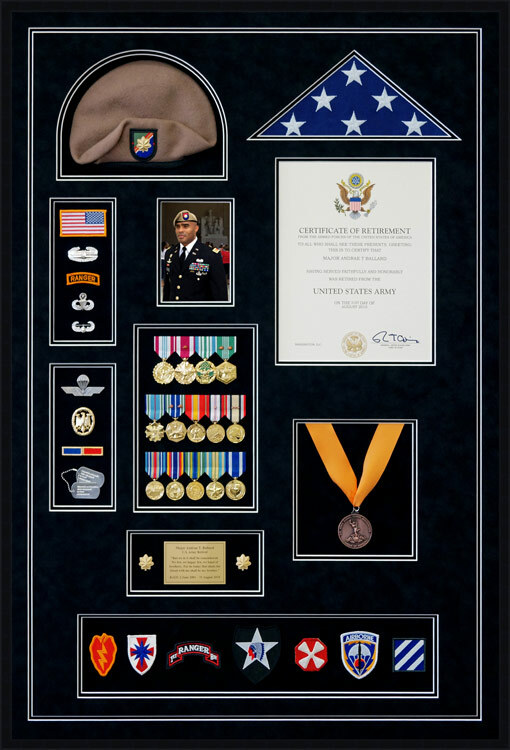 The items in his shadowbox tell the story of a dedicated career Army officer who has devoted much of his adult life serving America. Gaining him as a customer was a fortuitous event for us. We thank him for his service to the United States and wish him the very best in his future endeavors after retirement. Interested in a shadow box similar to this. Some variations of course. Can I contact you and see what we need to do to make this happen? Thanks!